There's a little fact about my toddler son Tyne that I've been keeping from the world...but today, I'm sharing it....Tyne is a bit of a trainspotter. Not just any old trains though....oh no...Tyne is a Thomas The Tank Engine SUPERFAN! Take a look at the video below....this is Tyne, watching some YouTube videos and guessing which engines from the series are being shown....I think his knowledge of them is pretty amazing for a 21 month old! Especially how he names some of them straight away, after only seeing them from above in black and white! It all started when, for his first christmas at 9 months old, we bought him a Ride On Thomas Train and Track - he absolutely adored it even though he had never actually seen Thomas The Tank before. And from then on...his obsession grew. Now he's almost 2...and I've never known a child to be quite so besotted with a character as Tyne is with Thomas & Friends! He gets the magazines regularly, he loves to watch not only the Thomas & Friends episodes but also loves to watch the many Thomas fan uploads on YouTube. He loves getting new toy engines to play with, and he can name ALL of them....show him a picture of all of the engines (and there are hundreds of them!) and I can guarantee you that he can name every single one - from the standard Thomas & James, to the more obscure Scarloey and Sir Handel - he knows them ALL! It's not like he sits around watching Thomas all day - in fact he doesn't watch it all that much at all - but he ADORES anything to do with it! He's so much of a superfan that he even talks about Thomas and his little engine friends in his sleep! I have made up a little story that I tell him every bedtime all about how Thomas helps to bring Tyne his birthday cake and has to overcome naughty Diesel 10 who tries to ruin the party - it's become his favourite bedtime tale and every night he asks me to tell him the story again! We're hoping to take him for his first visit to Thomas Land at some point this year - he will be in Thomas Heaven! Did you know that Thomas celebrates his 70th birthday this year?! It's fascinating to think this little blue engine has been entertaining children for so many years! Tyne was VERY excited to be sent the latest Thomas & Friends: Dinos & Discoveries dvd to review last week (And I mean VERY excited...whenever he helps me to open ANY parcel, he repeatedly says "Its Thomas, I think! "....and it never is....so when he opened this one and it actually WAS Thomas...he squealed with delight!). He watched it immediately, and absolutely loved it! The DVD features six never-before-seen episodes and follows on from the most recent Thomas movie, Tale Of The Brave, which Tyne got for Christmas and also adores! I was amazed to find that Tyne immediately recognised Samson -who is a brand new engine! - he squealed out his name as soon as he came on the screen - I have NO IDEA how he knows who all these engines are right away!!! The episodes include other favourites old and new - including Marion, Emily and Millie - and lots of Dinosaur frolics too! Tyne sat glued for the entirety of the DVD and chatted about it for ages afterwards, and - like with all of his beloved Thomas dvds - he wanted to watch it over and over again! 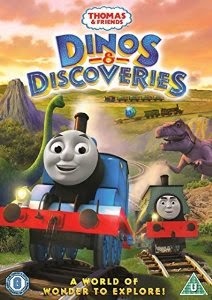 Thomas & Friends: Dinos & Discoveries is available from amazon and all good retailers now, RRP £9.00. Make tracks to www.thomasandfriends.com now for more Dinos & Discoveries fun including games, activities and video clips from each of the episodes. Toby loves Thomas too - he's like Tyne in that he can name any engine, regardless of whether it's a black and white colouring picture, or a more obscure engine. He loves steam trains too - his dad, and both granddads, work on the railway so he didn't stand a chance.